I’ve gone ahead and broken the rules for this year, because after the initial nominations were in, I saw an excellent example of stuntwork from 1915. So, there are six nominees this year. Oh well, that’s what happens when you run a major awards event from your apartment. Stunts don’t normally get the official recognition they deserve, and correcting that was one of the reasons for me starting the Century Awards in the first place. Now that all the performers involved are long dead, let’s acknowledge their physical prowess and risk-taking. The great thing about early film is that so many of the stunts were done by the stars themselves. Again this year, we see a predominance of slapstick, in the form of Charlie Chaplin and Roscoe “Fatty” Arbuckle on the slate of nominees. 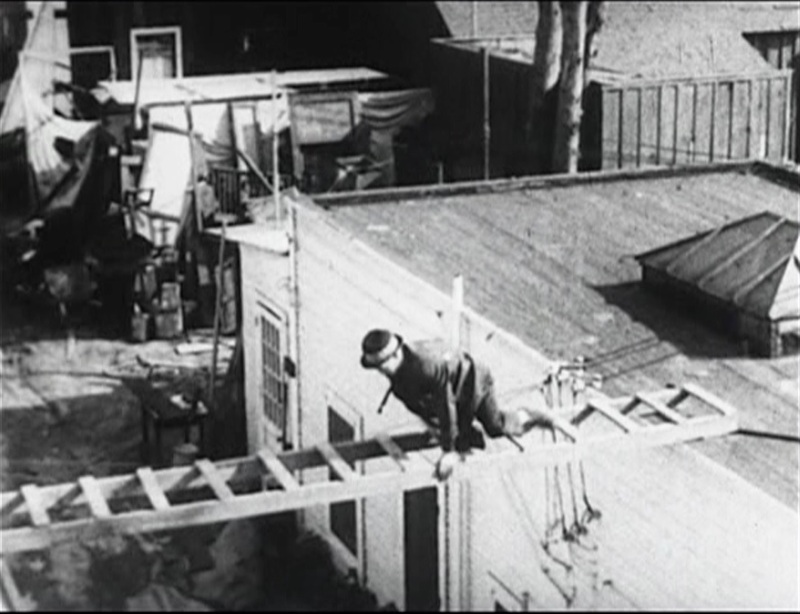 Chaplin’s “Work” includes some tricky business with a giant wheelbarrow and the gradual destruction of the home he’s supposed to be renovating. He shows us more fancy footwork in “The Champion,” in which several other actors (and a little dog) get into the boxing ring and show off their timing and agility. The Chaplin short “By the Sea” shows off comic timing in a tough situation when Chaplin and co-star Billy Armstrong get their hats tangled up in the wind. Arbuckle also had several good movies this year, but I thought the outstanding example was “Fatty’s Faithful Fido,” which also included the acrobatics of Al St. John and the ladder-climbing abilities of Luke the dog. Apart from those, we also had some action movies this year; as in “The Lamb” where Douglas Fairbanks gives us a taste of what would become his forte, while in “Regeneration” the villain manages some impressive hand-over-hand work on a clothesline. Ultimately, I was most impressed by the sheer number of stunts pulled out for this movie, which came out only days before Chaplin’s “The Champion” and parallels it to some degree. They’re both good, and both involve dogs, which made it a tough call, but ultimately between Luke and Al St. John I felt that the shorter film was actually the more impressive. 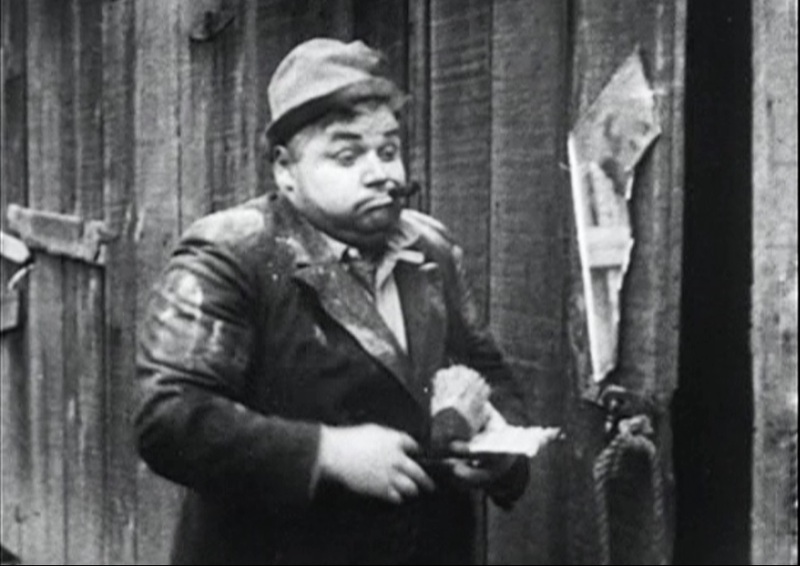 Roscoe “Fatty” Arbuckle seems to be imitating Charlie Chaplin’s “Little Tramp” character in this one reel comedy from Keystone about a homeless man’s efforts to patronize a bar. Arbuckle brings his own personal style, however, and a subplot about a mad bomber and a prank on the tavern owner makes this different from any obvious slapstick models. Fatty wakes up in a hayloft and combs his hair in front of a cracked mirror hanging on a fence. He is dressed in ill-fitting clothes and seems to have several days’ growth of beard. He smokes a cigar. He sees a dog and panics, perhaps expecting to be chased off the property, and finds himself in front of “Schnitz’s Bar.” He goes in and asks for a refill on his empty liquor bottle. The bartender (Slim Summerville) agrees, but then gets annoyed when he starts taking free samples of the food that is laid out for a breakfast buffet. The tavern owner (Mack Swain) comes out to moderate and takes the food back and also dumps out Fatty’s bottle. Then he forcefully ejects Fatty. Fatty breaks his bottle open and takes out the handkerchief inside, wrings it out into a glass and takes a drink. Back at the tavern, some of the patrons have seen a newspaper article about a bomber that has destroyed three taverns after being ejected for stealing food. They decide to play “a prank” by writing a threatening note which seems to be from Fatty. 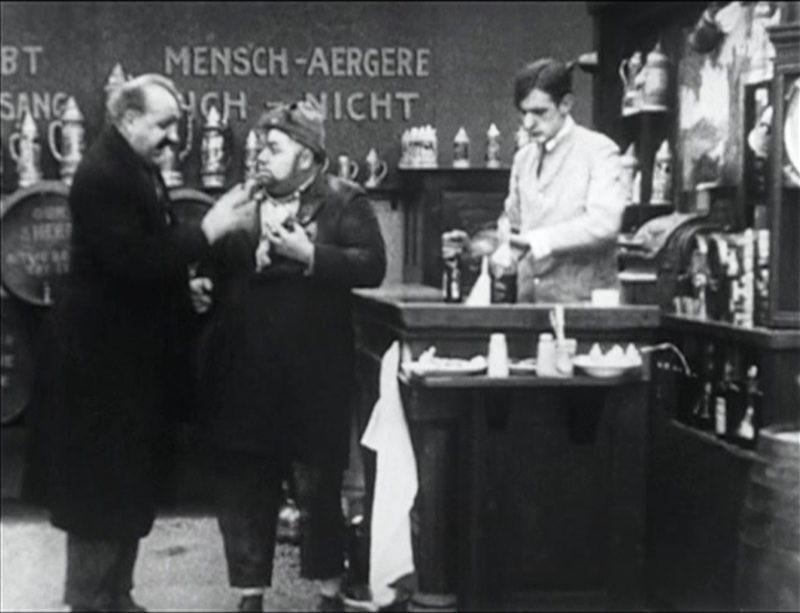 Meanwhile, Fatty runs into a rich gentleman (Edgar Kennedy) who gives him some money. He uses it to buy a round block of smelly cheese. The patrons and staff are clearing out of the tavern as the appointed time draws near, but Mack is still hanging around nervously, jumping at the slightest sound, when Fatty wanders back in with his cheese tucked under his coat. Mack finally panics and runs away, tearing through the streets of the city and leaving Fatty alone in the bar. He eats his cheese and pours himself free drinks, getting bolder and thirstier as he goes. Finally, he heads down to the basement to investigate the barrels of booze on hand. Mack has found some Keystone Cops to come back to the bar with him, thinking it has already blown up When they get there, Fatty is standing on a whiskey barrel with a mallet in the basement and he hits it, causing an explosion that knocks him upstairs and into the cops’ arms. Fatty finally passes out from all the booze. I was a tad hungover when I watched this, so not really in condition to appreciate all the drinking humor. I do think that Arbuckle manages to give the “tramp” character an original portrayal, somehow managing to keep his good-natured innocence even as he portrays an alcoholic bum. The disc I watched this on claimed the movie features “Mack Swain and Ford Sterling.” I spotted Swain well enough, and there’s a number of other recognizable Keystone players, but I never saw Sterling. I think it’s a mistake, because imdb, Wikipedia, and “The Silent Era” all give similar cast lists without Sterling’s name on them. Fatty does get a lot of screen time alone in this movie, despite the large cast, and some of the funniest bits are just him being drunk or doing bits of business by himself.